John Olsen limited edition 2011 digital reproduction archival print is available at Etching House, limited numbers available only. New John Olsen Giclee print Release titled Frog Pond was released by John Olsen as a limited edition number of 85 only and with a sheet size of 92cm x 91 cm, Frog Pond print by John Olsen is available at Etching House, the image was produced from the original painting or artwork of John Olsen and this work is referred to as a digital fine art reproduction or Giclee print, released in 2011, this fine art limited edition print is not a John Olsen etching as some may assume but an actual digital color print made on rag mat water color paper, archival quality pigment ink is used, the artwork reproduction of Frog Pond is hand signed in the lower right and carries a Olsen press seal on the outer corner, a certificate of authenticity is available upon request. 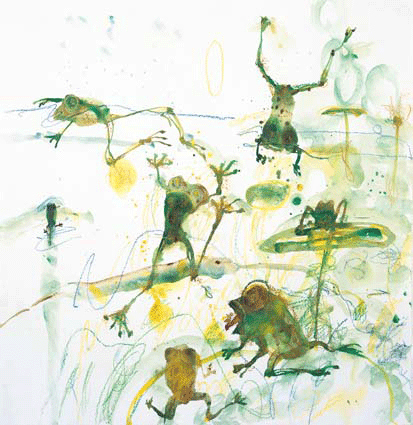 John Olsen Frog Pond print is available on lay buy for up to 12 months on 20% deposit. Shipping is by registered post person to person with Australia Post domestically or internationally, Etching House ships only with insurance; many other John Olsen fine art print are available framed or unframed from Etching House. Etching House specialize in John Olsen original paintings, prints, etchings and digital, Giclee reproduction artworks all hand signed and certified.